Warning:Valve springs can be tightly compressed. Use care whenremoving retainers and plugs. Personal injury could result. Caution:After cleaning the transmission components, allow to air dry.Do not use cloth or paper towels in order to dry any transmissioncomponents. Lint from the towels can cause componentfailure. Caution:Do not reuse cleaning solvents. Previously used solvents maydeposit sediment which may damage the component. Clean and inspect all valve components and the valve body. 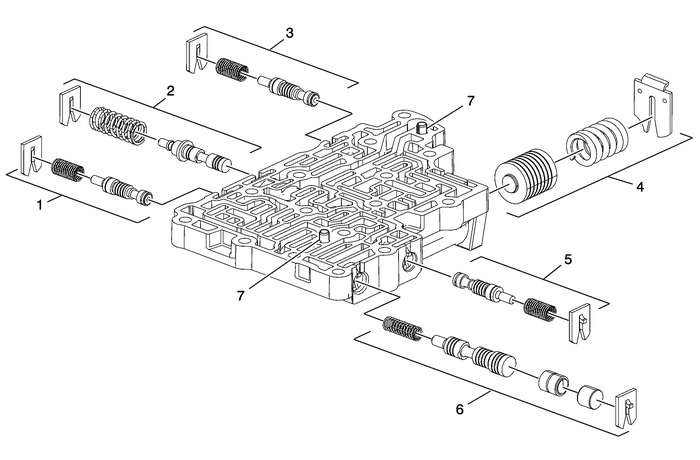 The control valve lowerbody is replaceable only as an assembly. Note:Inspect Valve Body locating pins for proper installed height of 4.25-mm (0.17-in).